► NIGERIA: Med-View Airlines leasing a 747-300 for Hajj/Umrah flights; 767s a possibility. Nigeria's Kano-based Med-View Airline (VL) has leased an B747-300 (MSN 23032 | TF-AME) from Icelandic ACMI specialists, Air Atlanta Icelandic (CC), with plans to add two B767-300s for use on Hajj and Umrah flights this year. ►► PHILIPPINES: Ethiopian Airlines cancels planned Manila, Ho Chi Minh City routes; nixes Singapore. [UPDATE 17 JULY] According to AirlineRoute, Ethiopian Airlines (ET) plans to adjust its East Asia operations from 18JUN13, with the tentative launch of 3 new destinations: Ho Chi Minh City (Vietnam), Manila (Philippines) and Seoul Incheon (South Korea). ► ZIMBABWE: Air Zimbabwe mulling either the A330/777 for future long haul ops. Air Zimbabwe (UM) is reportedly mulling leasing either the Airbus A330 or the Boeing 777 as a long haul replacement for its ageing pair of 767s, one of which, (MSN 24867 | Z-WPF), is reportedly undergoing a C-Check set to last 10-months. The other, (MSN 24713 | Z-WPE), is still serviceable though with the advent of the A320 on the airline's Harare - Johannesburg route, it has been parked and is now kept on standby for VVIP (i.e Presidential flights), charters and as a back up. Once refurbished, the aircraft should be deployed on London flights in November. ► UNITED KINGDOM: Air Zimbabwe pushes back London flights to November as 767s await refurbishment. Air Zimbabwe (UM) says direct Harare - London Gatwick flights, originally meant to launch from July 1 but now removed from the GDS, will now resume in November once their two 767-200ERs have been refurbished. ►► BRAZIL: Ethiopian Airlines to start 787 flights to Rio de Janeiro, São Paulo via Lome from July 2013. [UPDATE 19 MAY] Having postponed their intended December launch of flights to Brazil via Lome, Togo owing to "inconvenient slot times given the airline" by the Brazilian aviation authorities, Ethiopian Airlines is said to be readying itself for a possible 1 June 2013 service to Rio de Janeiro and São Paulo, Brazil via Lome, Togo. ► MAURITIUS: Condor to start Munich - Mombasa, Mauritius from late 2013. German charter carrier, Condor Flugdienst (DE), is to launch once weekly Munich - Mombasa and once weekly Munich - Mauritius flights in November and December respectively. Both destinations are currently served out of Frankfurt. ► UGANDA: British Airways 767 enroute from Lusaka to Heathrow suffers engine failure; diverts to Entebbe. 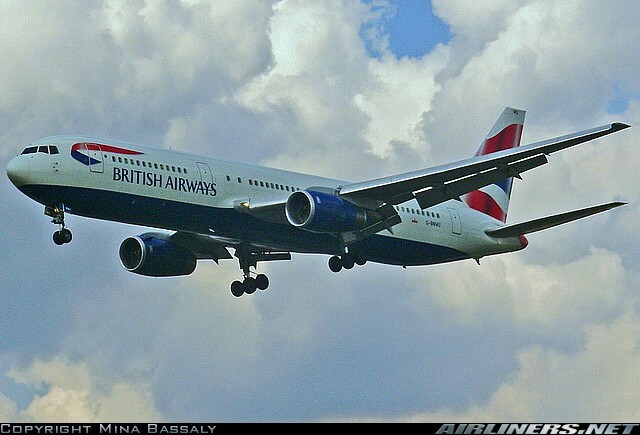 A British Airways Boeing 767-300 (MSN 25442 | G-BNWO) enroute from Lusaka, Zambia to London Heathrow, United Kingdom on Monday 14 January 2013 as flight BA254 was forced to divert to Entebbe, Uganda following the failure of its starboard engine. ► INDIA: Kenya Airways swaps 767 for 737-700 on some Mumbai flights starting 16 January. Effective 16 January 2013, Kenya Airways(KQ) is temporarily adjusting capacity on its Nairobi – Mumbai, India service. Three of the 10 weekly flights (KQ204/205) are to switch from the Boeing 767-300ER to the Boeing 737-700. ►► THAILAND: Ethiopian Airlines boosts Bangkok, Hong Kong flights from late November. [UPDATE 22 NOVEMBER 2012] Ethiopian Airlines (ET), will from 24 November 2012, increase its Addis Ababa – Bangkok – Hong Kong 767 operated service from 4x weekly, to daily. As a result, Bangkok will see an increase from 7x to 10x weekly flights. ► ZIMBABWE: Very low pax uptake for Air Zimbabwe's regional routes. In what is fast becoming a bad trait associated with Air Zimbabwe (UM), the carrier on Monday, flew an empty (i.e no pax) Boeing 767 aircraft from Johannesburg to Harare on its inaugural flight, as the carrier struggles to resume regional operations. ► SOUTH AFRICA: (Pics) Condor inaugurates Frankfurt - Cape Town flights. The arrival of Condor flight DE6228 from Frankfurt to Cape Town at 10h52L today, marked the launch of the airline's 2x weekly return Frankfurt/Cape Town flights. 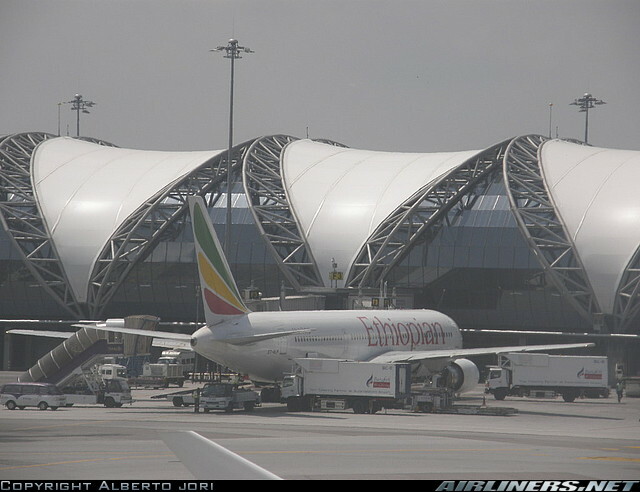 ■ GABON: Ethiopian Airlines gives Gabon Airlines 30 days to pay up or risk losing its 767. Ethiopian Airlines' MRO has given Gabon's now defunct Gabon Airlines (GY) thirty days as of 24 October 2012, to pay up over €750'000 it owes the facility for repairs and maintenance done to its Boeing 767-200 (MSN 21877 | TR-LHP), now stored in Addis Ababa since 2010. ► CANADA: Ethiopian announces 787 ops to Toronto & Frankfurt for Winter 2012. Ethiopian Airlines (ET) has announced further adjustments to its planned Boeing 787 operations. Frankfurt, Germany will receive the 787 on a daily basis from 27 October 2012 replacing its current 767, whilst Toronto, Canada's current 777-200LR service will be replaced with a 787 effective 9 November. ► ZIMBABWE: Finally, Air Zimbabwe to resume flights in November. As reported previously by The African Aviation Tribune, Air Zimbabwe(UM), the on/off Zimbabwean national airline, has confirmed its intended return to service in a news conference held last night in the Zimbabwean capital, Harare. ■ MADAGASCAR: Government courts Corsair International to resume Paris to Nosy-Be flights. With Air Madagascar's (MD) Airbus A340-300s too big for Nosy-Be's (Fascene) Airport, the Malagasy Government is attempting to lure French carrier Corsair International (SS) back to Madagascar's largest and busiest tourist resort, as they are the only carrier with the equipment (Airbus A330s) capable of operating a direct Paris - Nosy Be flight from the airport, at this time. ► GERMANY: Ethiopian to reduce Frankfurt service to 6x weekly from late October 'til late November. Ethiopian Airlines (ET) will temporarily reduce its Boeing 767-300 operated Addis Ababa, Ethiopia - Frankfurt, Germany service from daily to 6x weekly, effective between 28 October 2012 'til 25 November 2012. ► LIBERIA: British Airways confirms Monrovia via Freetown from November. In confirmation to our original post on the topic, British Airways (BA) have confirmed they will resume three times weekly flights to Monrovia, Liberia albeit via Freetown, Sierra Leone using a Boeing 767-300ER, effective 5 November 2012. Freetown was originally meant to increase to a 3x weekly service effective 31 March 2013. ► MALAYSIA: Ethiopian Airlines launches Kuala Lumpur from late October 2012. 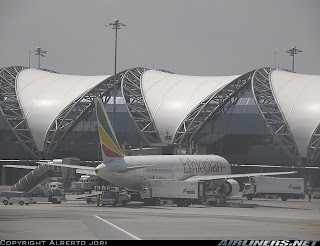 As reported by The African Aviation Tribune in late July, effective 31 October 2012, Ethiopian Airlines (ET) is to start a 3x weekly service from Addis Ababa, Ethiopia to Kuala Lumpur, Malaysia via Bangkok, Thailand using a Boeing 767-300ER. The existing Addis Ababa, Ethiopia – Bangkok, Thailand – Hong Kong service is to be reduced from 5x to 4x weekly. Consequently Bangkok will see a daily service once again. ■ CAMEROON: Ex-minister accused of embezzlement in "Albatross" Presidential Jet fiasco goes on trial in Yaounde. Former Cameroonian Interior Minister Marafa Hamidou Yaya, the politician at the centre of the Cameroonian Presidential Jet scandal, is currently on trial in Yaounde facing charges of embezzling USD$31million that should have been used to buy a new Presidential Jet sourced from the Boeing Company for President Paul Biya. The story goes, in 2001, Yaya, then Secretary General at the presidency, and his co-accused, amongst whom are the ex-head of the now defunct Cameroonian flag carrier Cameroon Airlines Yves Michel Fotso, Chief Ephraim Inoni, a former Prime Minister and head of government under Biya, Nkounda Julienne, and two others, were mandated by the Cameroonian Government to secure a Boeing Business Jet Second Generation (BBJ-2) for USD$31million for use by the President. It is then alleged that in early 2004 they instead colluded to hire a used Boeing 767 - The Albatross - for USD$2.6million and pocketed the remainder of the money for themselves. But, as fate would have it, with the President and his family on board, the Boeing 767-216ER (TZ-AAC) developed technical problems on its maiden flight to Paris, France on 24 April 2004 and was forced to make an emergency landing. So irate was Biya at this embarrassing scenario that he launched a full investigation into the mishap, which culminated in Marafa's arrest along with that of the other five co-accused. Since the story broke in April 2004, there have been numerous wild allegations in the Cameroonian press that the aircraft itself was 'totally unsafe' and was in reality "a flying coffin" thereby putting the President and his family at risk each time it flew; some even claim that the purchase of the defective plane constituted an "attack on the nation of Cameroon itself". Deeper investigation reveals that official testimony seems to dispute the claims that the President's life was in danger and that the situation was so dire as to warrant the emergency landing, though ironically, had this not happened, then perhaps Marafa and his associates could have gotten away with it all. 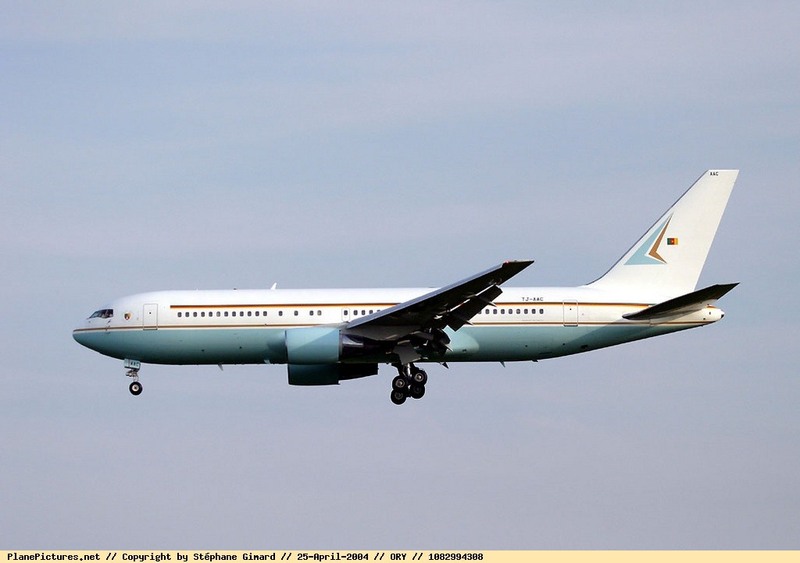 "[The "Boeing 767-200 ER" known as "Albatross"] was transported to Cameroon in a flight leaving from Atlanta in the United States on 04/22/2004 and landing in Yaounde on 04/23/2004. It departed again from Yaounde on 04/24/2004 for the Roissy-Charles de Gaulle airport in Paris, with the President of the Republic and his family aboard, as well as a large delegation of important persons from Cameroon travelling to attend a summit planned for the following days in the French capital. Only, the plane had barely taken off from the Yaounde-Nsimalen airport with the illustrious person and his delegation aboard, when it experienced an incident while it was crossing the "Foumban" area. This incident made it necessary for the pilots to turn back to Douala. It was described as purely technical, in which "the leading edge flap was not retracting" and the plane could not reach cruising speed. While the plane was turning back to Douala, the onboard mechanic was called upon "to go down into the fuse room." While he was there, the mechanic "reset the circuit" and, after another try by the pilot, the flaps retracted and the situation returned to normal. The plane then resumed its heading toward Paris." "When the problem (with the flaps) occurred, the pilots (Lieutenant Colonel Ndongue and Colonel Babodo Lewono) should have called for the mechanic seated at the end of the aircraft. All they needed to do to rectify the problem was to refer to the flight manual and to call for the mechanic. Instead, flight captain Betham chose to inform the President of the Republic that there was a problem with the aircraft and that it had to return to Douala for a checkup. He reassured the Head of State that this would not take long. In my opinion, the captain demonstrated a lack sang-froid by rushing to alert the President. He should have tried to solve the problem first." Subsequently, the Cameroonian Government returned the aircraft to Boeing who disputed their claims that the aircraft was in terrible shape. Eventual litigation led to the Cameroon Government being forced to pay Boeing USD$2.6million for breach of contract. But, at the end of the day, the case is not about the overall airworthiness of the Boeing 767, its about 5 high ranking government officials who were tasked with the responsibility of buying a brand new BBJ but instead hired a second hand 767 and whose actions, by a strange twist of fate (had the Captain kept a cool head and treated the flap malfunction as routine instead of informing the President then this whole incident may never have come to light), were exposed for what they are - fraudulent. At the beginning of May, a former Cameroonian ambassador to the United States, Jerome Mendouga, was jailed for 10 years in connection with the case. ► SIERRA LEONE: British Airways adds third weekly flight to Freetown. From 31 March 2013, British Airways is to add a third weekly flight on its London Heathrow - Freetown, Sierra Leone route using a Boeing 767-300ER. In early July, British Airways had announced a reduction in service on the route from 3x weekly to 2x weekly following the replacement of the previous aircraft used on the route - a BMI Airbus A330-200 - with the aforementioned 767.